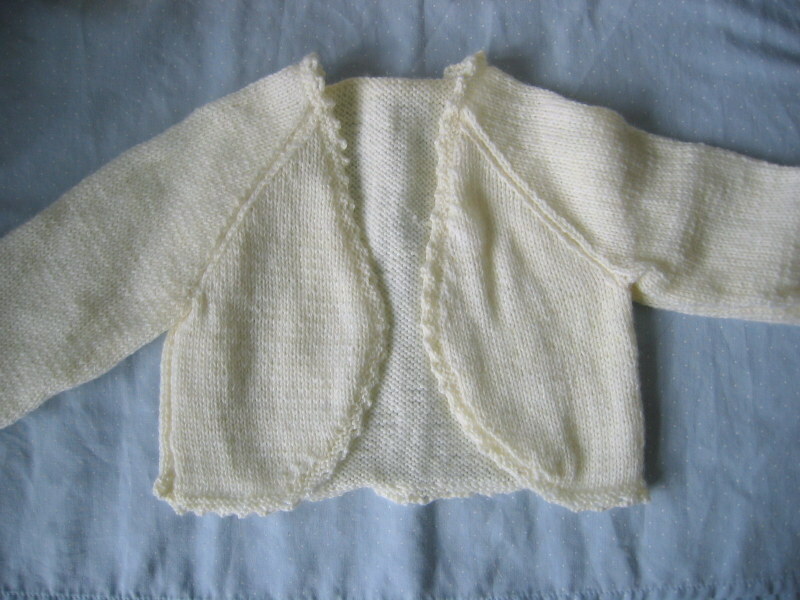 Those of you who follow me on twitter will have heard me talking about the cardigans I’ve been making for Little Miss (who as of yet hasn’t made an appearance so could still be a little man I suppose). 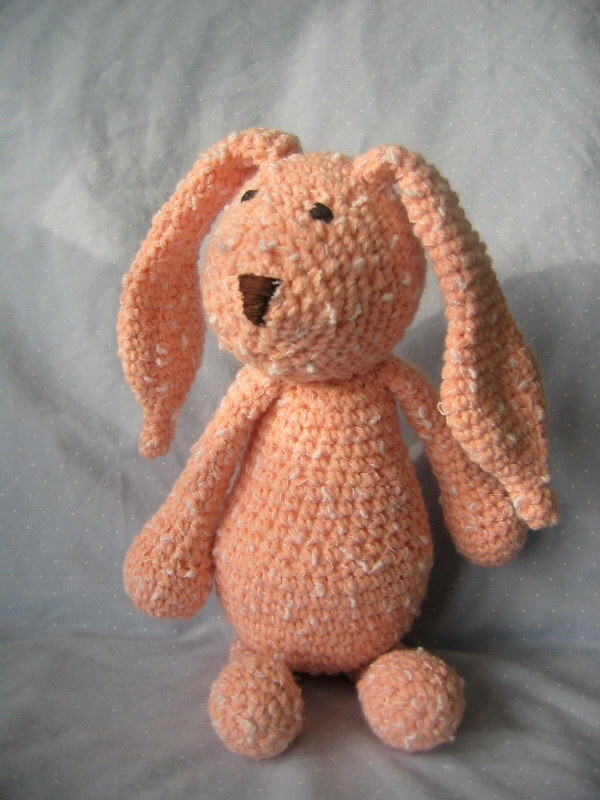 I’ve also had fun making Toft Alpaca Shop little bunny in this months Simply Crochet Magazine. It’s been nice crocheting and knitting little person things. Here’s the bunny. I had some left over pink Sirdar Snuggly Tiny Tots DK yarn and I think the texture works really well. I enjoyed making it and it was actually quick to make. I might just have to make a friend! This is the first Cardigan I made. I made all of them 9-12months so that she can wear them when it gets cold again. 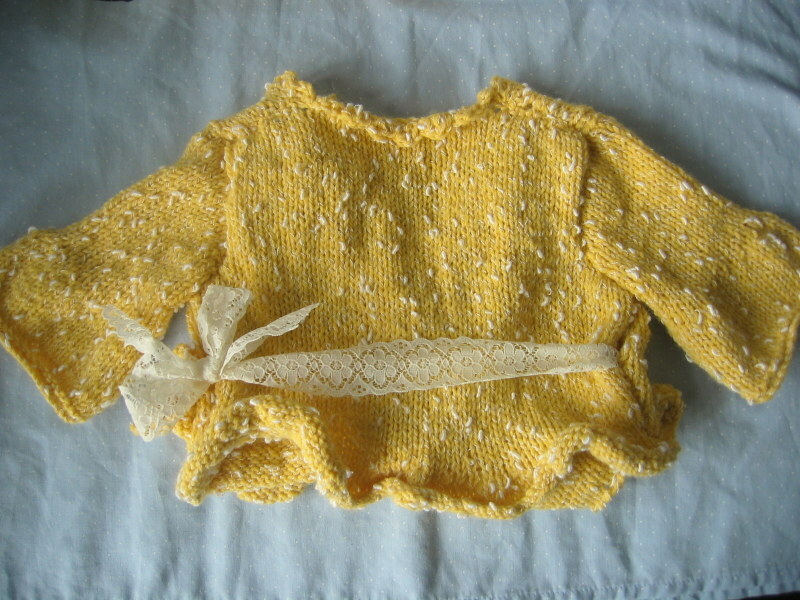 I love yellow and when I found this wool I knew I had to make something with it. 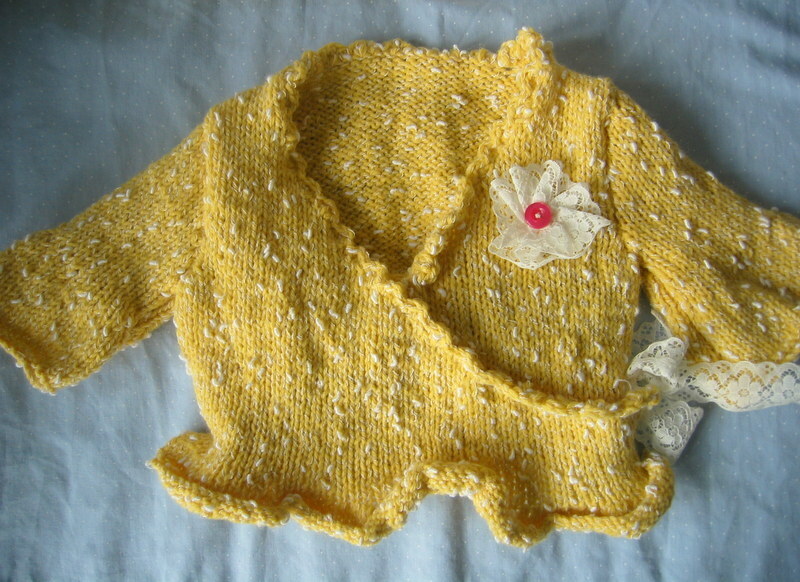 I liked the look of this pattern too as it’s different from a lot of the baby patterns. For the buttons I tried a number of different shapes and colours but in the end opted for little pink roses. The colour goes nicely with the yellow and I found that somehow normal round buttons didn’t quite look right. 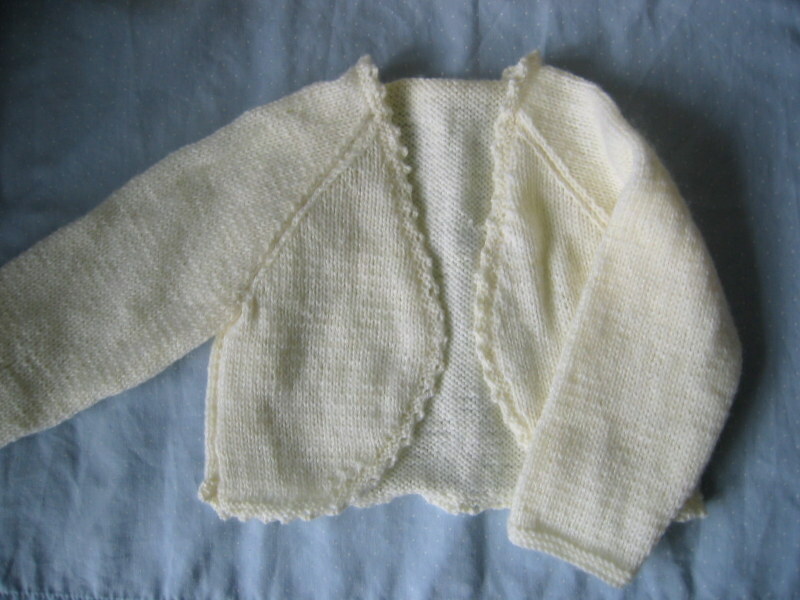 This one is worked in Sirdar Snuggly 4ply (the first time I’ve worked a garment in 4ply). It’s a little cut off jacket which will look great with a couple of winter dresses we’ve already been given. Here it is with the sleeve so you can get an idea of the size. You can’t really see it in this picture but the edging around the front and the collar is really pretty and was one of the reasons I chose this pattern. 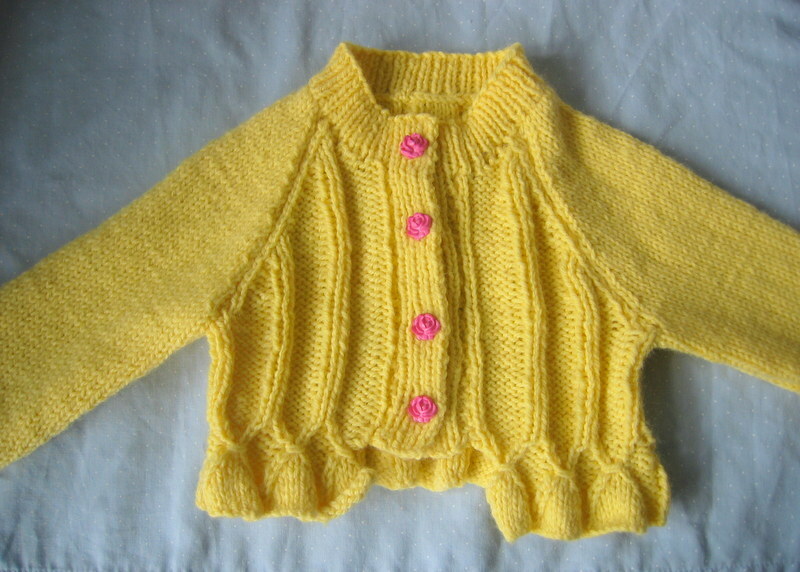 This is the final Cardigan I made (yes I know another yellow cardigan). This one is a wrap around and I did adapt the pattern slightly. I wanted to do a simple crochet edge (I think it works quite well). I made a simple ribbon flower with a button in the middle as I felt it needed something extra. This may well come off by the time Little Miss wears it (depends if it’s likely to go in her mouth!). I also decided to use lace rather than ribbon or a knitted cord as a tie around as I think with this yarn it looks more delicate (the picture doesn’t really do it justice). I’ve decided to try and dress Little Miss in as many girlie things as possible because I’m sure it won’t be long until she’ll want to dress herself! Now I’ve got these out of my system I’m focusing on making a couple of shawls for me. Hubby gave me enough wool for Christmas to knit a shawl that I’ve had the pattern for since my birthday but couldn’t justify treating myself to the wool (he knows me so well!). There was also a pattern for a quick shawl in a knitting magazine I picked up, so I think I might have to try that one too before baby comes.